You can record videos in slow-motion by increasing the recording speed to emphasize the movements, and play back the slow-motion video smoothly. Playback time when recording speed is 300 fps will be 5 times of the actual recorded time. Press the TIME CONTROL button. Select the recording speed by using the adjustment dial. Images may appear grainer recording is performed at high speed and with reduced resolution. In addition, it is recommended that a tripod be used, and recording be performed in a bright location, by setting “GAIN UP” to “AUTO”, since it is darker than normal shooting. Audio sound is not recorded together with the video. When high-speed recording is enabled, only the optical zoom can be used. During high-speed recording, “TOUCH PRIORITY AE/AF” is set to “OFF”. During high-speed recording, scene counter may not operate smoothly. 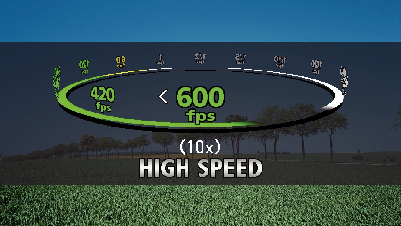 When a SDXC card is used in high-speed (600fps) recording, recording time is limited to 3 minutes. Press the TIME CONTROL button, and then select “60fps” by the adjustment dial. Normal recording mode can be resumed by turning off the power of this unit.